The multi-sport athlete is a special breed. They are the ones that love the thrill of competitive sports so much that the concept of taking a break is not an option. It takes multiple talent and discipline to be one. However, overtraining is a major problem they face. Make sure you don’t ignore any signs you are overtraining. As a male high school student athlete, you may choose to play Football during the start of the school year, Basketball during the winter, Soccer during the spring time and opt for a more competitive challenge playing AAU Basketball or rep league Football during the summer season while off school. If you are a female high school student athlete, you may choose to play Field Hockey during the fall, Volleyball during the winter and Softball throughout the spring and summer seasons. Can all this be done while remaining accountable to achieving great grades and managing your social life? Something has got to give, right? Usually what gives and deteriorates over time is your body due to overtraining. You know, the few times something feels off and your limbs won’t do what your body is telling you to do without a hitch – particularly during an important weekend long tournament or showcase. 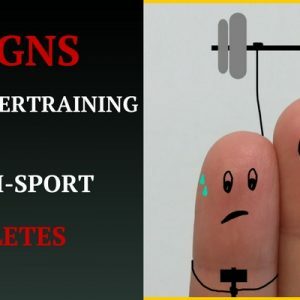 So whether you are a multi-athlete playing sports or training for one sport all year, how do you know you are overtraining? How can you avoid it so you can excel both on and off the field of play? Being a multi-sport athlete, participating in multiple teams at a given time or perfecting your sole sport every day can be exhausting. You have to remember you are human and not a genetic freak or mutant from the Marvel comic book series. Most student athletes who maintain such a hectic physical schedule and are used to performing at a high level will face times when they may not recover well. Your performance will likely suffer, health will deteriorate, and everything they’ve worked to achieve in school, sports and life may be compromised. Listen to the directions of your coach, parents or peers and take a rest day or two. Your life isn’t a Nike ad. DOMS (delayed onset muscle soreness) is known as the gradually increasing discomfort that occurs between 24 and 48 hours after physical activity. DOMS is a natural response in your body that should go away in a day or two. However, if your joints, bones and limbs are aching, this can indicate poor technique or improper form and put you at risk for injuries. If you are feeling awful after more than 48 hours, this is a telltale sign you are overtraining. This is common for those power/explosive/anaerobic athletes such as a sprinter in track and field, a power forward in basketball or a Linebacker in football. In such cases, your sympathetic nervous system dominates, meaning you are more susceptible to hyper-excitability, restlessness, and an inability to focus (especially on athletic performance), even while at rest or on your off day. Sleep is generally disturbed in sympathetic-dominant overtrained athletes where recovery slows, and the resting heart rate remains elevated. Basically, the body is reacting to a stressful situation by heightening your nervous system’s activity levels. And you thought that caffeine or that energy drink left you all jittery? Endurance athletes such as soccer players and cross-country long distance runners are susceptible to this. As too much resistance training can cause sympathetic overtraining, too much endurance training can cause parasympathetic over-training. This is associated with decreased testosterone levels, increased cortisol levels, debilitating fatigue (both mental and physical), and a failure to lose body fat. Athletes in this condition are worse off as chronic fatigue can impact not only your athletics but your academic and social life as well. Being fit enough to run ten miles doesn’t mean that you now have to do it every single day. It seems like an odd occurrence but often times overtrained student athletes think they are putting on lean muscle mass only to do the opposite in eating away their hard earned muscle and gaining body fat. Your hormones are to be blamed as the main culprit for why this happens. Have you been feeling like you are burning calories, working out and training like a madman only to see your definition decrease? Chances are you are overtraining. You’ve been overtraining, and the all-important testosterone:cortisol (T:C) ratio is lopsided. A positive T:C ratio means more muscle and less fat, while a negative ratio means you’re either training too much, sleeping too little, or some combination of the two. Either way, too much cortisol will increase insulin resistance and fat deposition, especially around the midsection. Have you been feeling like you are working so hard only to see your definition decrease? Normally after a grueling workout, you want to eat everything your hands can get a hold of within the fridge. However, if you suffer from a loss of appetite following a vigorous workout, this can be a sign that you’re training too much – especially for those endurance or aerobic training athletes. The American Council on Exercise lists the “loss of appetite” as one of the top indicators of over-training your body. Again, your hormones are to be blamed for an unhealthy increase in the release of epinephrine and norepinephrine, which are both appetite suppressant hormones are to be blamed in this instance. Those that do a lot of endurance or aerobic training need to be aware of this. Be sure to monitor your daily calorie intake and ensure you are getting the proper nutritional benefits to fuel your days as a student athlete. Many things can compromise your immune system. A lack of eating due to dietary changes (i.e. increased sugar intake), lack of Vitamin D/sunlight, poor sleep habits, mental stress are all usual suspects. A nagging sore throat here, a little snotty nose or two there, some congestion and a sinus headache, perhaps. It’s a common trap to fall into for over trained athletes as your immune system may be suffering from the added stress. If you’ve recently increased your workout, practice and game day output, keep track of those early morning sore throats and coughs. Any increases may indicate a poor immune system brought on by overtraining. Being talented and disciplined enough to play multiple sports is exciting. Although the busyness of your athletics may keep your schedule full from day-to-day, falling into the snare of overtraining is a vicious cycle. Who wants to be sore all the time, lack sleep, constantly fatigued, not enjoy great food, get fat and become a walking snotty mess all at once? So to start, if you have not done so already, be sure to create your profile on Classlete.com for more access and begin your journey to balancing school, sports, and your social life today. 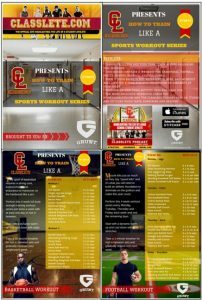 If you are a high school student athlete, know of one or are a parent or teacher, sign up for our email newsletter by clicking here and you will get a free download of a sports specific workout co-created with the strength and conditioning coaches at Grunt Performance to help you dominate the sport you love playing. Join us on this journey as we are committed to supporting and helping the next generation of student athletes become the top of their class both on and off the field.